In considering the professional experience of the phlebologist of the Baltic Vein Clinic Ints Ūdris, he was selected as one of the first specialists in the world to be trained to work with the new biological adhesive technology, therefore representatives from the organisations of the founders of this innovative technology from USA and Germany visited Latvia to express personal recognition and award Dr. Ints Ūdris for already 135 surgeries performed with biological adhesive technology. „To be honest, this trip is very special to us – we are here to honour and express recognition to Dr. Ūdris who is one of the leading users of Venaseal product in the world. On global scale he is the fourth most experienced specialist in this area, therefore this is a significant moment – to be here and thank him for his efforts and work as user and practitioner of Venaseal system,” says Gary McCord, Vice-president, Head of Business Development of SAPHEON Incorporation*. Baltic Vein Clinic is the fourth in the world that has achieved such a number of patients, besides this number is increasingly growing - no only among local but also foreign patients. To a certain extent it is related not only to the fact that Baltic Vein Clinic has more than 15 years of experience in vein treatment area and 12 years of experience in the application of endovenous technology methods (laser surgery, radio frequency, steam micro impulse and sealing of veins with biological adhesive) but also it is the only clinic in Eastern Europe offering all endovenous vein treatment methods in one place. Due to this reason many patients from North America, Europe and Asia come to the Baltic Vein Clinic and comprise approximately 10% from the patients undergoing surgeries here. 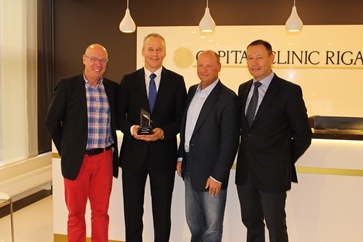 Currently there are three medical centres that have already received this award; all of them are situated in Germany. 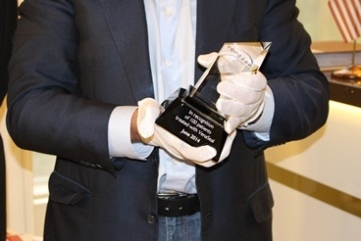 Other clinics have yet not managed to reach the level provided by the Health Centre 4 and Dr. Ūdris, therefore this is the fourth centre that receives the above-mentioned award. This makes Riga and Baltic region the second largest development place of the new technology. 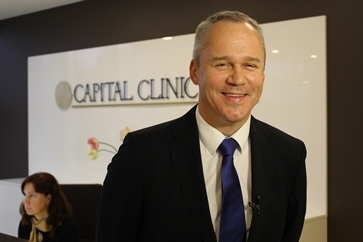 „I can’t think of any other medical centre of equal value that could compete with this high class and technology centre that I see today”, comments Dieter Bielang, Sapheon Sales Director in Europe. This technology has not yet been accessible to wide public and general health care system as initially manufacturers cooperated only with very high class clinics, therefore also cooperation with Dr. Ūdris and other doctors of the Health Centre 4 was commenced as they expressed great desire and expertise to get to know the latest technologies. „Justification of this I see here, in the new affiliate of Health Centre 4, the Capital Clinic Riga. It is truly beautifully and exceptionally, this clinic is a real masterpiece and synergy of the most state-of-the-art technologies. Equipment the clinic provides is outstanding and corresponds to the highest standards in vein treatment; rarely in the world do you see something like this. 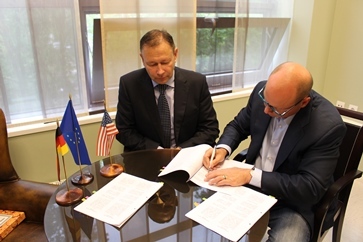 We continue to expand our cooperation with the Baltic Vein Clinic that is one of the three training centres in Europe and one of the five training centres in the World and we are happy to have a cooperation partner so great!” SAPHEON Incorporation Vice-president, Head of Business Development Gary McCord is delighted. Biological adhesive method provides very high level of safety and comfort during surgery and postoperative period. Technically surgery is carried out similarly to other endovenous surgeries, only it does not require anaesthesia and additional injections are not needed. It is completely painless and during the surgery vein, surrounding tissues and nerves are not exposed to thermal effect that happens when laser, radio frequency or steam method is used. Due to this reason haemorrhage does not develop after the surgery and a possibility of traumatizing sense nerves of the skin is eliminated and skin zone does not become insensible that can be quite frequently observed with patients after vein laser surgery in the area of shank - ankle. This surgery can be safely performed to patients with low pain level to whom thermal vein surgery methods like radio frequency or laser surgery can cause discomfort and feeling of pain; as well as to elderly people, persons with heart conditions and people having side illnesses that limit application of other methods. You don’t need to wear compression socks after application of biological adhesive and it is a positive thing especially during summer, for elderly or corpulent people and persons suffering from rheumatism of joints and having difficulties to put on compression socks. Besides, usage of biological adhesive does not have a seasonal character. *Company of medical equipment SAPHEON Incorporation offers new guidelines and develops innovative technologies that substantially improve treatment of vascular and vein diseases.